I have always admired the look of a gold leaf lampshade, but I have not admired the price. DIY to the rescue! I did the DIY gold leaf lamp shade for two different shades. I absolutely love the look of the gold leaf paired with the warm glow of Edison bulbs. I like it even better when I just squash my liberal guilt down and tell myself that it is an accent light and I don’t reaaaalllllyyyy need to be using the LED’s to save the environment… Anyway, back to the tutorial. Lamp shade: Note the underline and bolding. 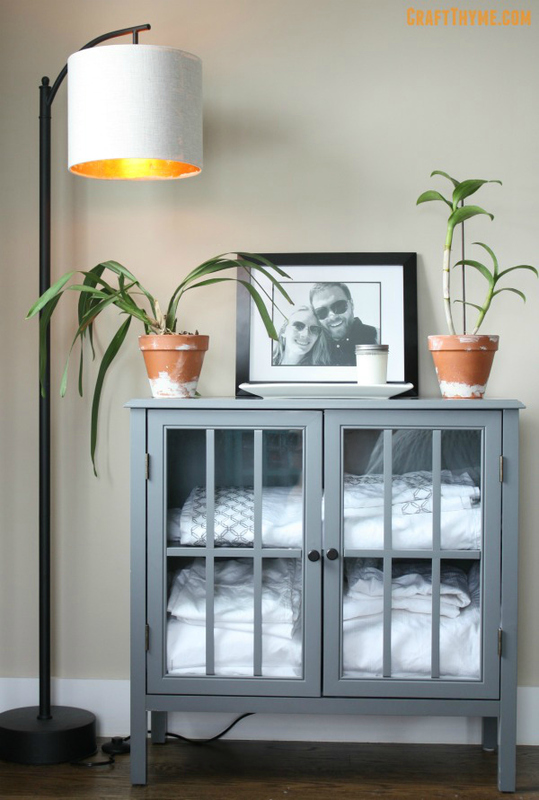 The lampshade selection is key to choosing the correct materials from this point forward! 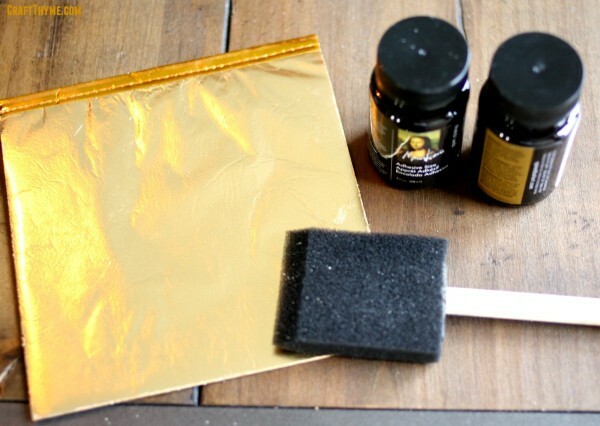 Gold Leaf Sheets* : I grabbed a Gold Leaf Kit* and ordered a refill. I needed somewhere in the order of 40 sheets to do two normal sized lampshades. I am not advocating using real gold here! The gold toned sheets give a great finish at a tenth of the cost of actual gold. Soft Brush: Does not need to be expensive and frankly I misplaced my bristle brush and just finished up with a sponge brush. I might have been too lazy to dig through the paint supplies to find a nicer brush, though, the results would likely have a smoother finish. Replace this sponge brush with a nice soft bristle brush. Don’t be a lazy cow like me! 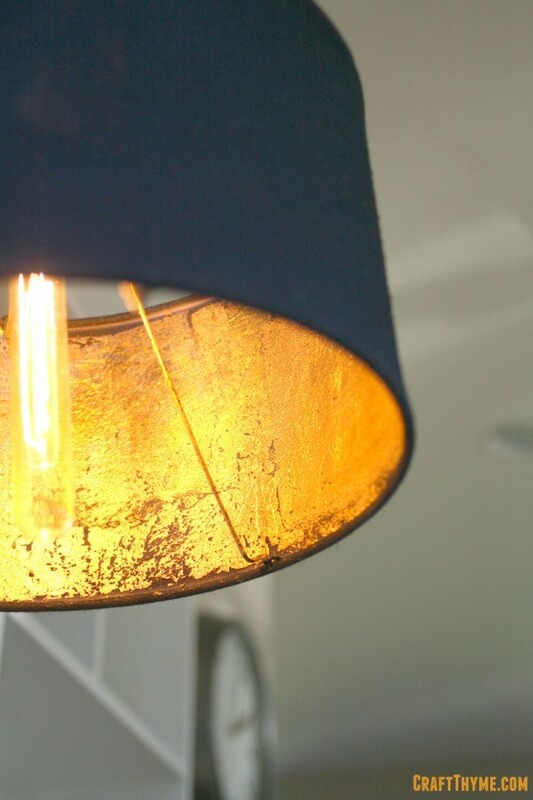 Is your lamp shade old? ugly? Old and Ugly? Give it a good cleaning, spray paint the hell out of it, and or bedazzle the exterior until you are happy with the look. You’ll need to complete the outside prior to the gold leaf. What’s that you ask? 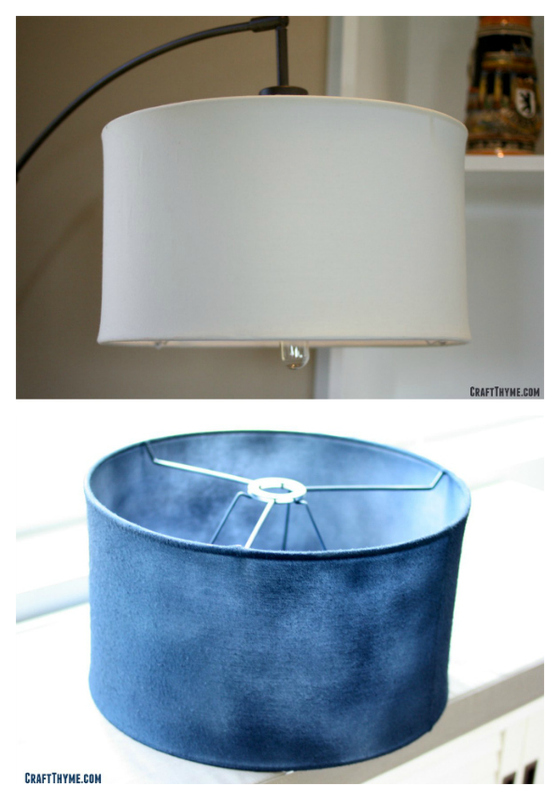 Can you spray paint a cloth lampshade? Hells yes you can. Just remember it will soak up a lot of paint so be prepared to do a few coats. All gold leaf applications require that you have a tacky adhesive set and ready prior to gold leafing. What this means in layman’s terms is when you touch a prepared surface it will need to feel sticky to the touch. Picture your counter after you have left some sugary substance dry and you get a nice sticky feeling. Liquid adhesive is painted on and left to dry anywhere from 10-30 minutes. Spray adhesive is instantly ready. Remember to only apply in areas large enough that you plan to work with soon. The sticky places can overly dry or collect dirt and lint. I worked in 1/4 shade size pieces. Make certain to cover any areas that you do not want to gold leaf! Small particles of leaf will flake off during the leafing process and cling to any sticky areas. Great if you plan on having gold in that area, bad if you do not. By covering, I might have meant just take some old fabric and cover the areas you do not want to be sticky. Oh look, I used some old cardboard as a work surface again. I think the ship has sailed on me ever having a nice prepped work surface and all materials present at the time of crafting. First and foremost, the gold leaf is not actually attached to the little booklet. The pages in between are there as protective dividers. Don’t be a dork (maybe like me) and spend a good amount of time trying to rip out a page. Lightly touch the gold leaf with clean fingers and kind of fan out the leaf above your project. Where ever it touch the sticky part it is going to be STUCK. So just know that wrinkles, ripped pages, etc are going to be part of the first few attempts. This worked fine as I wanted an industrial, patchy look. Also if the interior surface is not hard, you are never going to get a smooth appearance. You should check out my tutorial on gold foiling fabric for an alternative if you are looking for a completely smooth fabric finish. Gold leaf is delicate and faux gold leaf will tarnish and change when not protected. The kits come with a paint on sealer but you can use any clear acrylic coat designed to cover metal. Paint or spray your coating. Once dry place your lampshade on and admire! Use common sense here! You just added a reflective metal coating to an item that surrounds a hot light bulb. Monitor the heat that your lamp is putting out. Use a lower wattage or LED lightbulb if you detect any abnormal heat. A good looking lampshade is never a reason to start a fire!!! Absolutely. Hard metal is much easier to gold leaf! I have a burlap lamp shade; it has those little “hairs” sticking out. I want to make it gold on the outside, but how? Will it look good to gold leaf burlap? When you put the sizing on it would probably stick most of the hairs down. Otherwise the gold will just stick to them. I think it would give it a cool shabby chic look. Send pictures if you try it! What I might consider doing is to spray the burlap first with a shellac spray to make it all come together first, then leaf it. Thanks for stopping by. 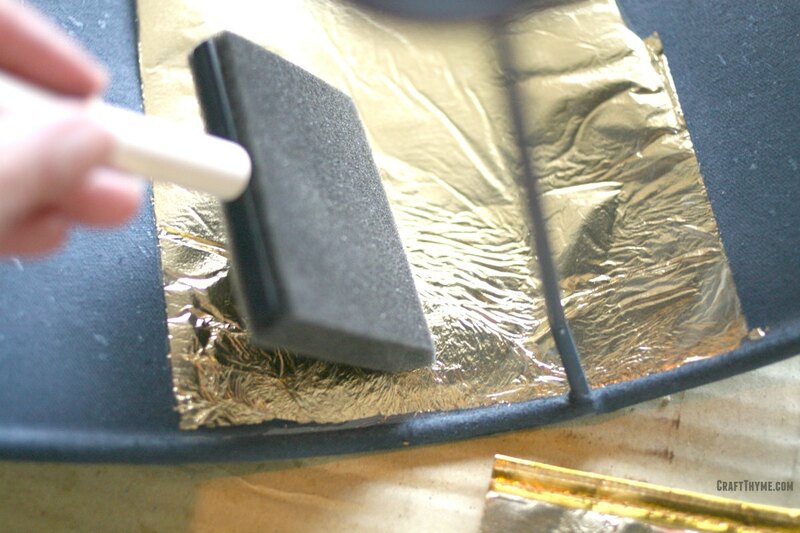 Gold leafing your own lamp shade is easy! And much cheaper than buying one. Can’t thank you enough for the feature. Thanks for visiting. Great tips the only thing I have gold leafed was pears at Christmas lol – Thanks for linking up to Pin Worthy Wednesday, I have pinned your post to the Pin Worthy Wednesday Pinterest Board. I’m a douche when it comes to DIY but this sure looks easy enough to attempt when I buy myself a new lamp (does it defeat the purpose?). PS/ Like the look of your blog! One lamp was rather new so I do not think changing the shade defeats the purpose at all! Thanks for the compliment. This is awesome! Thank you for sharing all of your tips, LOVE! I love this! I’ve pinned several gold leafing projects lately (Would it be too much to gold leaf my whole house? ), but you offer some of the best tips on making it happen. Thanks for sharing! I’ll be pinning. I have really been into the gold leaf lately myself. It is not bad to do after a few practice runs. Lovely job. I’m not much of a do-it-yourselfer but I sure like window shopping! I think I feel similarly about cooking. Love to eat, look at recipes, not much for the actual cooking. Thanks for dropping by. Thank you! I am not sure about the too many lamps… We actually have some packed away. We love to buy and refurbish ones from thrift stores. Great tutorial! 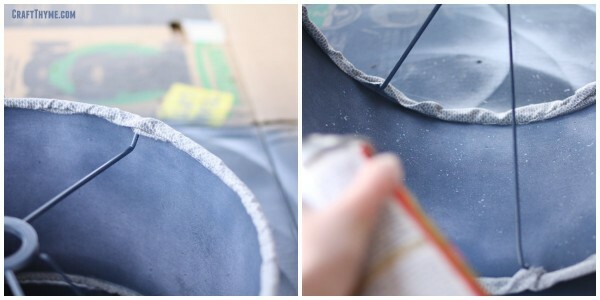 I recently tried a similar project – using liquid gold leaf on the inside of a lampshade. I like your way better! It looks richer and has more character. First, I absolutely love the name of your blog. Secondly, I have tried to use liquid leaf because I was scared to try gold leaf and it seemed kind of expensive. BUT, I found that nothing can beat the richness of the actual leaf. I think the pits and flakes give it real character. Do not get me wrong I think there are great applications for liquid leaf and rub & buff. Leafing is really the only way to get this look for a lampshade. Sponge brushes are so easy, reusable, and cheap. I use them as is, cut up, and have even used the handle for a dowel pin in a pinch! They are not perfect for every project but they can usually get the job done. Thanks for dropping by!